War reportage cartoonist Joe Sacco dusts off an ignored story of massacre. In the United States, My Lai may still be remembered as the one recognized massacre of the Vietnam war. And the El Mozote (see Mark Danner) carnage may be recalled by a few Americans who were aggrieved by U.S. involvement in Central America in the Reagan years. 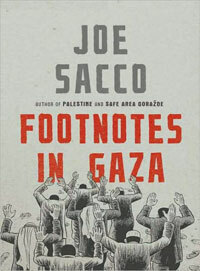 Now comes Footnotes in Gaza: A Graphic Novel (Metropolitan) by Joe Sacco (Palestine and Safe Area Goražde), a cartoonist /journalist who is credited with creating war-reportage comics (think Waltz with Bashir and The Photographer). Sacco uncovered and investigated the little-referenced shooting of 356 Palestinian civilians by Israeli soldiers (from a U.N. report filed Dec. 15, 1956) in the Gaza town of Rafah (on the southern tip of the Gaza Strip bordering Egypt), posing the question of whether this was a deliberate massacre or an awful error. And in exactingly detailed images Sacco vividly renders the unresolved conflict of over half a century of depredation in Rafah and the neighboring town of Khan Younis.